Per usual, I'm off in some foreign land (aka Pittsburgh) lying in an uber comfy bed, posting from wifi internet that is not my own. Complaining? I think not! I must admit I do miss the BF (I'm sorry I try to remove all sappiness from my posts but that just had to go in). Anywho, I'm only here until tomorrow and then I'm back to the big apple. That's right George Clooney from Up In The Air, you have some mileage competition right here. Shocker of the century? These shoes are from American Eagle. Yep, I'll just let that simmer with you for a while. And if you didn't know, American Eagle frequently has insane sales. Take it all in and breathe. Poor and want to shop? (story of my life fyi) I can help... right this way. oooh, these pants are gorgeous..so RUNWAY!! And like the way you have styled them! PS. I am there too, would love if you could vote for me too! I am style.delights in popular contestants. It's been really tough for me to imagine a pair of printed pants rotated in my wardrobe...I fear it'll swallow me whole since I'm so petite, yet I LOVE that this one from J.Crew is so monochromatic with subtle florals...Amazing find! I may just have to pick this one up this weekend! omg gorgeous outfit as always! your outfits always make such a statement! love it! 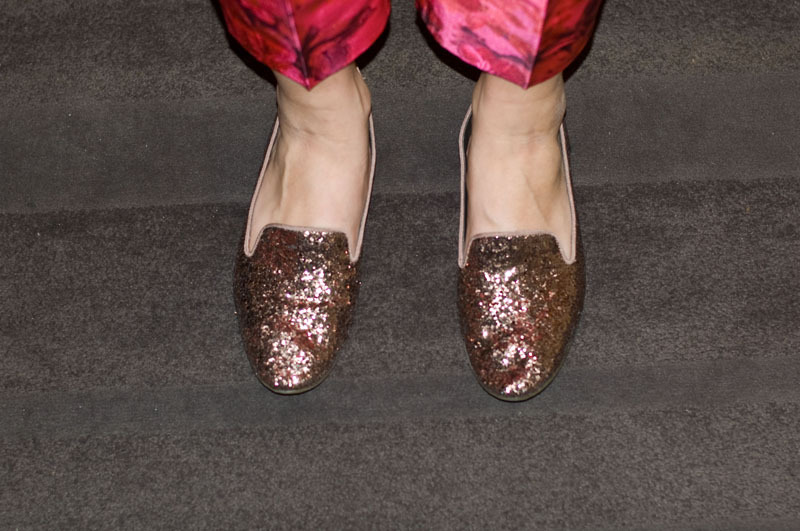 Love your pants - floral print looks awesome with sequins flats! Darling those are beautiful pants. I love so much the shape and print!!! Shoes! Necklace, Pants! It's all amazing!